From Romantic Castles and Palaces, As Seen and Described by Famous Writers, edited and translated by Esther Singleton; New York: Dodd, Mead & Company, 1901; pp. 236-244. Next to these now destroyed Armourer’s and Falconer’s Towers, comes the Abbot’s Tower (the large corner one), where the abbot had apartments, whenever choice or necessity caused him to leave his abbey, snugly situated down in the wooded valley by the river-side. Beyond this is seen the West Garret, and the outer of “Utter Ward,” with its square and octagonal towers, and its advanced barbican, forming a picturesque mass of great size and strength, and a noble entrance to a noble castle. Walking along the parapets from the Round Tower, we pass East Garret. Beginning at the left hand, we first come to the Guard House, and the Auditor’s Tower, which flank the southern gate. The south wall is then continued to the Middle Ward, which, as being the second great entrance to the castle, is a building of great size and strength. Over it was the chapel, approached from the library, — a noble room that occupied the greater part of this block of building — but which has now been converted into the private apartments of the Duke and Duchess. 239 This block of building divides the two courtyards, and is terminated in the Keep, whose two semi-octagonal towers were added, in advance, to the old square Norman tower, by the second Lord Percy, about the year 1350. A series of escutcheons on the upper part of the towers helps us to the date of their erection; and though we know not their architect, we have full proof that he did his work well, for the towers have not needed repairs up to this day, and even a rector’s legal adviser would experience some difficulty in awarding dilapidations. The moat and drawbridge that guarded the entrance to the Keep have long since passed away; but, at the time of my visit, a fieldpiece, backed up by a pyramidal pile of cannon balls, did harmless duty on either side of the gateway, and playfully menaced the Auditor’s Tower and the Guard House on the opposite side of the courtyard. The ground-floor of the octagonal towers of the Keep is lighted by long arrow slits that admit a thin wedge of light to the wine-cellar, on the left hand, and to the chief dungeon, on the right. Each of the lodges at the various gates was furnished with dungeons; but this was the chief dungeon for the State offenders. Its size is eleven feet four inches, by ten feet four inches. In the floor is an iron grating, over a pit; and, a light being lowered into this for the depth of eleven feet, discloses a horrible grave (worthy of Naples and the dark ages) nine feet by eight, into which the wretched prisoner was lowered, or shot like a sack of coals. Let us thank Heaven that such a place can now only be shown as a curiosity. The breakfast-room was 240 over the gateway: we see one of its windows over the mound of the Keep. The windows in the first round tower, and the windows in the flat wall to the left, lighted the old dining-room. The next round tower contained the old drawing-room whose interior shape was that of the ace of clubs. A portion of the low curtain-wall is seen at the base of the Keep mound; and then, immediately on the right is the postern tower, or sally-port. In the lower part was a laboratory; in the upper part, a collection of old armour, and a museum of miscellaneous antiquities; Roman remains; small cannon, used at the first invention of gunpowder; and the old standard bushel of Northumberland, and a chain of several links, that could be bound around an arm, like an iron chain, and was carved out of a solid block of stone. Let us now pass between those two great octagonal towers, and up the long dark tunnel that will lead us into the heart of the Keep, the third, or inner court; the carriages rattle under that dark archway with a peculiar dull sound, for its pavement is of wood, as is also the pavement of the inner court. It is a polygon, having nine sides of various dimensions, besides other little angles, and it is about a hundred feet across from the one side to the other; and, as it is walled in with high towers on every side, it has somewhat of a well-like aspect. Its two great architectural and antiquarian curiosities are the Saxon (or Norman, if you are a great stickler for this point) mouldings on the inner face of the archway, presenting a great diversity of enrichments — and the old draw-well, for the use of the castle during a 241 siege. This is built in the thickness of the wall, with three pointed arches, surmounted by one large discharging arch, on the point of which is a humorous-looking corbel, supporting the figure of a priest, who is in the attitude of blessing the water. The old axle, with its pegged hand-wheels, still remains, and this interesting draw-well has not been interfered with in the recent alterations, though the aspect of the Inner Court has been altered by the addition of the covered drive. I have not space to dwell upon these matters, although 242 there is very much to interest us in the records of the Castle and its owners, and much for salient anecdote and gossip, not only as to the people but also their manners and customs. As, for example, that curious manuscript book, dated 1512, which tells us how the fifth Earl and his family lived; they had fresh meat from Midsummer to Michaelmas, and salt meat for the rest of the year; how the servants rarely had anything else than salt meat, with few or no vegetables (the roast beef of Old England being a mere Jack-o’-Lantern to them); how my lord and lady had no sheets to their bed, and only washed their tablecloths once a month; how they rose at six, breakfasted at seven on a quart of beer, a quart of wine, two pieces of salt fish, six red herrings, four white herrings, and a dish of sprats — half a chyne of mutton and a chyne of boiled beef being added on flesh days; how they dined at ten and supped at four, and went to bed at nine; how there were only two cooks, with two assistants to provide for a household of two hundred and twenty-three, and how the head cook was so great a monarch that when he gives an order for the making of mustard it bears this preamble: “It seemeth good to us and our council;” how the players at Christmas had twenty-pence for every play, and the rockers in the nursery had as many shillings each year; how, in the winter, only a peck of coals were allowed for each fire, and no fires after Lady-day, except half-fires for my lord and lady, and the nursery. There is all this, and very much more, that is both curious and interesting, but space, and not material, fails me. Nor can I speak of the out-of-door lions of Alnwick, — 243 the park, the gardens, the model farm, the Duchess’s dairy, the ruins of Alnwick Abbey, down in the sequestered dell by the river, the ruins of Hulne Abbey upon the slope of the hill over against the Castle — Brislee Tower, a Strawberry-hill erection eighty feet high, called by Mr. Walter White “an elegant structure”; but, in my humble opinion, a very hideous affair, and a fit companion to Kew Pagoda; and more useful than ornamental, for the summit commands a glorious view; — the monument to commemorate the capture of William the Lion, and the cross to commemorate the death of King Malcolm. It bears the following inscriptions: “Malcolm III., King of Scotland, besieging Alnwick Castle, was slain here, Nov. XIII., an. MXCIII. — K. Malcolm’s cross, decayed by time, was restored by his descendant, Eliz. 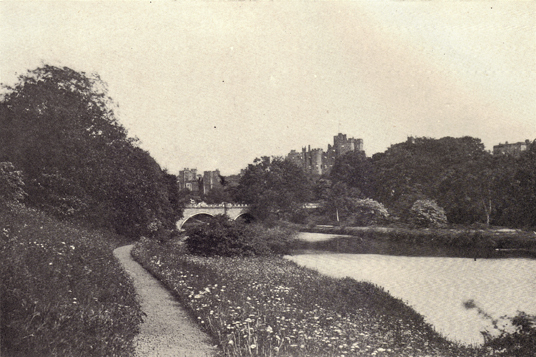 Dutchess of Northumberland, MDCCLXXIV.” It is distant about three-quarters of a mile from the castle, on the opposite side of the river; but, from what the ancient chartulary of Alnwick Abbey says, the spot where Malcolm died was two or three hundred yards nearer to the castle, where Malcolm’s Well now is. Malcolm was ravaging Northumberland with fire and sword, and, in due course, laid siege to Alnwick, which was stoutly defended by Moroll of Bamburgh. When the garrison could hold out no longer, a certain man rode forth to Malcolm, bearing the keys of the castle tied to the end of his spear, and presented himself in a suppliant posture, as being come to surrender up possession. Malcolm advanced to receive the keys, when the soldier pierced him with a mortal wound, and, dashing through the swollen 244 river, escaped by the fleetness of his horse. Malcolm dropped dead; a panic arose among the Scots, and the desperate defenders of Alnwick made a successful sortie, and put their enemy to the rout. Prince Edward, Malcolm’s eldest son, received mortal wounds in this fight. The old Abbey chronicle says that the soldier’s name was Hammond, and the place where he swam the river was called “Hammond’s Ford.” But Hector Bœtius has improved the story into a legend, and says the soldier’s name was Mowbray, and that he pierced Malcolm through the eye, and from that circumstance acquired the name of Pierce-eye, and became the founder of the proud family of Percy, Earls of Northumberland. A very pretty legend, but somewhat damaged by obtrusive facts, especially by that fact that the ancestor of the family was that William de Percy, of the town of Percy in Lower Normandy, who was one of the Norman chieftains who came over with the Conqueror, and whose name is recorded in the rolls of Battle Abbey. * Alnwick is pronounced “Annick,” according to a hilarious essay on British pronunciation, on this very site, called Does Queen Victoria Speak English? by Frederick S. Cozzens.